A series of parliamentary questions reveal costs of €53,142 to send 12 ministers around the world to mark the national holiday. The €53,000 bill does not include the expenses of Enda Kenny - whose costs are likely to match those of the rest of his ministers put together. CABINET MINISTERS have revealed the costs of their travel abroad for St Patrick’s Day. A series of parliamentary questions tabled by Sinn Féin’s Sandra McLellan revealed that 12 ministers ran up total costs of €53,142 for flights, accommodation and other travel expenses for themselves and assistants. The highest costs were incurred by junior education minister Ciarán Cannon, whose trip to China cost a total of €11,449, while justice minister Alan Shatter’s trip to Australia incurred costs of €11,367. Tánaiste Eamon Gilmore ran up costs of €8,467 for himself and four advisors travelling to Canada, while Brendan Howlin incurred costs of €7,035 for his travel and stay in Singapore. Chief whip and junior defence minister Paul Kehoe, meanwhile, incurred costs of €3,745 in his trip to Beirut and the Lebanon, with other ministers incurring lesser costs as their travelling distances ran shorter. The data revealed also shows that some ministers opted for economy class travel while their colleagues took business class seats – Richard Bruton’s delegation to San Francisco travelled by economy class, while Alan Shatter took business class flights to Australia. In his own response, however, the justice minister said he and his delegation had taken economy class internal flights within Australia, and had kept costs to a minimum elsewhere by travelling by taxi or on foot instead of hiring a full-time driver. Finance minister Michael Noonan ran the smallest costs of any minister, incurring costs of €978 for his travel to Paris. In his case and in that of Brendan Howlin, ministers stayed at local Irish embassies in order to minimise the costs of their travel. The €53,142 total bill does not include costs incurred by ministers Jimmy Deenihan (New Orleans), Dinny McGinley (Scotland) and John Perry (Sweden), whose details were not available for inclusion in the responses to the parliamentary questions. 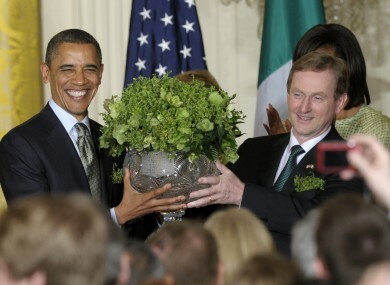 It also does not include the costs incurred by Enda Kenny, who travelled to the United States for his five-day visit on the government Gulfstream jet, which costs some €3,270 per hour to run. Kenny used the jet for a total flying time of 17.5 hours – indicating that his costs alone, when fully calculated, are likely to match those incurred by the rest of his cabinet and junior ministers put together. The government and ministers regularly claim that the costs of their travel are a vital step in securing overseas investment in Ireland, and in maintaining relationships with the Irish diaspora. Do you think the €53,000 bill for 12 ministers represents a good investment? Email “€53,000 bill to send ministers away for St Patrick's Day”. Feedback on “€53,000 bill to send ministers away for St Patrick's Day”.